Getting multiple App Pool sensors on a server with this error. The weird thing is, all applications are started and running fine - the other handful of App Pool sensors are also reporting fine still, why would these one's not be? I've verified Remote Registry service is running. The following script will act as a workaround for the native sensor, which sometimes has connection troubles. While the problem looks simple to fix, it's more than a mere bugfix. It's buried deep within the Performance Counter framework we're using and is a lot of work to fix (with unforseen caveats). Hence we came up with the following. Caution The culprit however is, that in order to work properly you need to configure PRTG's Probe service to run in the context of a user that is allowed to access the targeted hosts (by default it runs in the context of "Local System"). So usually this should be a domain admin, that way you make sure that all sensors requiring Windows credentials work properly. Save this script in PRTG's install directory into subfolder "....Custom Sensors\EXEXML"
Set parameters as shown in the image attached, while the name behind "instance" reflects the name of the desired app pool. 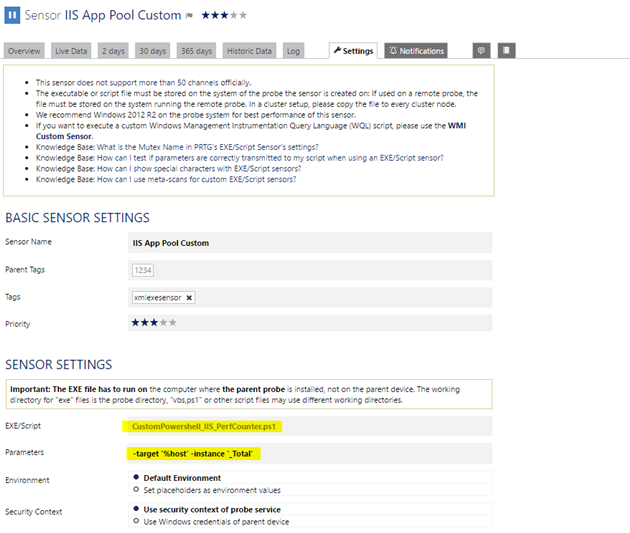 Let it run for some time additionally to the standard IIS App Pool sensor and let us know if this runs more "stable" than the IIS App pool sensor or if both are failing around the same time. Do they work intermittently? Or always down? Are they in an idling state perhaps? After a reboot of a VM, a handful of the App Pool sensors will we Up, but the majority will be down. It tends to last for a few hours. Sensor interval is 60s. Did you already try to recreate the sensor to see if that resolves the issue? I am having this same issue, anyone fix it yet? Did you already try to restart the corresponding target host to resolve the issue? Has the sensor been recreated already? we have same issue (No data to return. (Performance Counter error 0x800007D5)) with 6 WMI Netzwerkadapter/Network Sensors. Those sensors are set up to monitor different Virtual Server. Until last week sensor on those machines runs fine, since 10 days - no data error. Nothing was changed on VMs or Network, they just turned to error state. Nothing of them works to reanimate the sensor. But creating a new (redundant) WMI Netzwerkadapater sensor, works. New sensor works fine and deliverst gereen working state. How to reanimate the sensor, in case we are still interested in historical monitoring data? Please drop us a mail via support@paessler.com, referring to this thread. I'll send you the workaround script then. After rebooting a monitored webserver (VM), the first node picks up all App Pool sensors. However, the second node for most of the App Pool sensors gives the error "No data to return. (Performance Counter error 0x800007D5)"
Unfortunately I cannot afford to restart the probe on the 2nd node each and every time a VM restarts. So if there would be a proper solution, that'd be greatly appreciated! We have the same issue, sensors work perfectly well until the server is rebooted then some, not all sensors remain in an error state forever. The account we use is a domain admins. The only solution is to restart the probe. Or use the script approach above. Unfortunately, fixing this issue is requiring a lot of work under the hood which we can't do as of now, as there are other things we need to take care of first. Sorry about the ongoing issues regarding this. It does look like you already know what the problem is. Care to share? So we can come up with a better workaround than start using custom scripts? We really don't, Corné :( It remains to be seen if a refactoring of the modules will resolve the issue. In the meantime, the custom scripts are the best option for the time being. Dear all, I'm impacted by this bug and support team pointed me to this solution. I adapted the scritp to my needs, and it seems working correctly, but is still a workaround. Is it possible to know if there is a planned deadline for stable solution? Why should we use a custom script: app pool monitoring should be one of your a major focus, and the first segnalation is two years old. No ETA on a possible solution, unfortunately. As it's a major rework, affecting thousands of installations and Sensors :( Sorry.